November: This is the time all you ultra runners sit and wait with anticipation for the lottery results. Odds are never in your favor and disappointments abounds. Fear not. Those few races that fall into the lottery category make up only a small fraction of the races out there to be had. Also, not all of you are interested in participating in ultra races. You may be perfectly happy conquering an awesome half marathon or even a 3.6 mile uphill race. Only you know. December: Its time to make some decisions. It seems like a long ways off to choose a race but it’s the best time to commit. Your chances of getting into various races are better, coaches have probably not filled their rosters for 2017 yet and it’s a great time to convince your family. Remember, if you don’t have family support, your journey to a successful race will be that much more challenging. Besides, it’s better if they’re along for the ride. Here we go. I’m going to break this down by month as that helps when making decisions. Also, to keep this list reasonable in size, I’m limiting it to regional races (easy drive from Truckee-Tahoe). #1. First on my list is the Racing Gnome Snowshoe Run. (Tentative date: January 29, 2017.) This 10km event has moved around a bit. 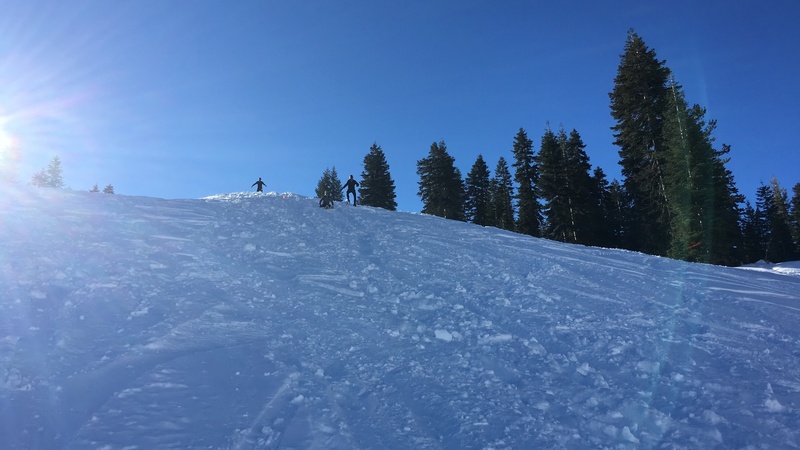 It started at Royal Gorge, it spent some time in Johnsville and last year returned to Auburn Ski Club at Donner Summit. This two-lap course offers runners a chance to really red-line, challenging the steep climbs, the single snowshoe packed trails and the infamous final downhill. It’s a great low-key event that allows you to really experience what snowshoe racing is all about. Runners facing the downhill finale’ at the Racing Gnome snowshoe races. #2. Inside Trail Racing director Tim Stahler has an arsenal of trail races to participate in. The Marin Ultra Challenge (a.k.a. MUC, March 11, 2017) has quickly risen to the top of must-do early season race lists. He offers a variety of distances from 25 km up to 50 miles. The coastal trails are lush and green this time of year and the weather is typically fantastic. I’m not a weather man and everyone that did it last year would argue that point. Regardless, it’s a great race if you need to get off the hill and down to the bay. #3. I’ve got two for April. First off Canyons. 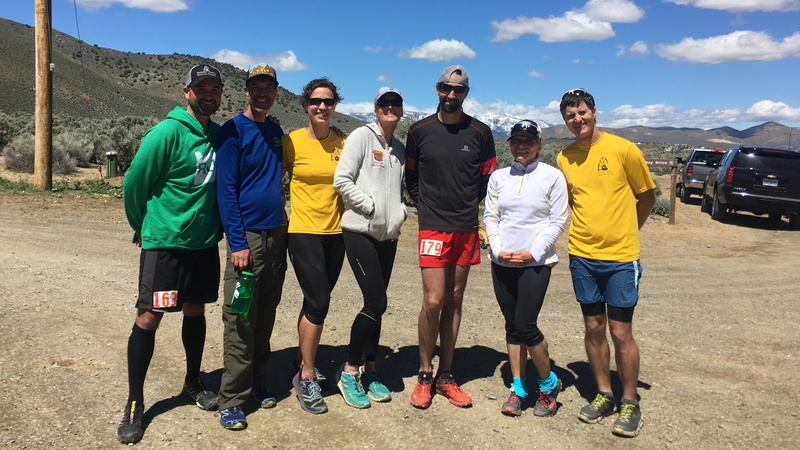 (April 29, 2017) If you’ve been stung by the Western States bug then it is a must-do. New this year Chaz added a 5km and 10km that supports non-profits in Foresthill. If your significant other is a ultra junky, one can do the 100km or 50km while the other enjoys a 5km or 10km. #4. The other April must-do is Escape From Prison Hill Half Marathon (April 22, 2017, Carson City, NV). This course has all kinds of fun stuff going on, some fire road, rocky single track, rolling sand hills and steep sandy downhills. I try to make it out to this event every year. It’s so much fun. Coach Peter Fain and some of his Run on Dirt athletes at Escape from Prison Hill Half Marathon. #5. The Silver State Striders put on a great race with 3 distances (50m, 50km, 1/2 marathon) called the Silver State 50/50 and 1/2 marathon. This iconic race in Reno, NV, has been around a long time and they continue to improve the race experience before, during and after the event. #6. The second running of Broken Arrow Skyrace (June 17, 2017) in Squaw Valley will test your climbing legs. There is a VK, 26k and a 54 km. These races are so much more about conquering the climbs than the distance. #8. 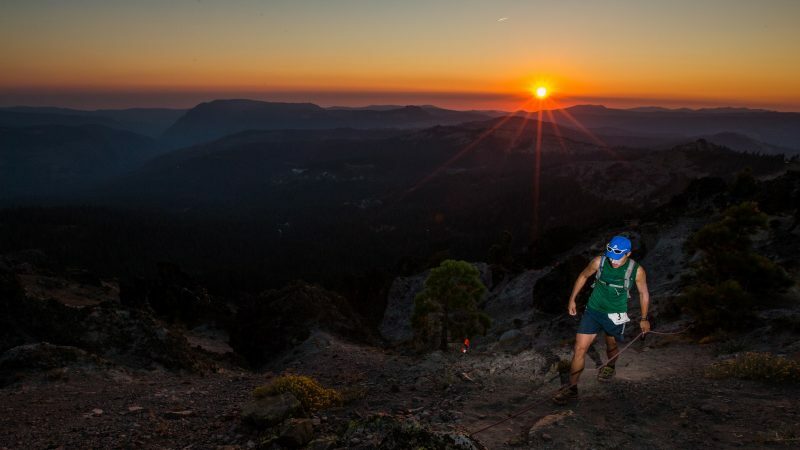 I would be remiss if I didn’t include Donner Party Mountain Runners Castle Peak 100km. This course is all about having the opportunity to experience what I believe to be a collection of the best trails that Truckee has to offer. There is only one distance and this race is not for the faint of heart. A mountainous 50-miler is required to even register, but don’t let that deter you. “Unafraid,” we like to say. A runner emerging from Sugar Bowl’s notorious Palisades at the Castle Peak 100k. Photo: Scott Rokis. #9. If 100k is not yet in your wheel house, consider our friends at Auburn Ski Club. They produce the Sierra Crest 30km and 50km (August 6, 2017). The course touches on a few miles of the Castle Peak 100k course and is also a point-to-point race. #10. Big Blue Adventure hosts a bunch of races, but the Emerald Bay Trail Run is extra special (September 17, 2017). It’s 7 miles and is also a point-to-point run on one of Tahoe’s great (short) trails. Fall in Tahoe is a great time to run along the lake and even take a post-race dip in Big Blue if you dare! There are so many more races and this list could go on and on. For now, dig in and see what these races have to offer. You will not be disappointed by a single one. Stay healthy, cross train and get that core strong – 2017 will be an epic year on the trails. Contact Peter Fain for a training consult if you’d like help planning your 2017 trail running season.